Imagine walking on pearly white sands, with crystal clear waters lapping at your toes, while the sun gently warms your face. If you fancy enjoying the laid-back Barbados lifestyle without spending a fortune, Time Out Hotel is a fantastic budget option. Perfectly situated in the popular beach resort of St. Lawrence Gap, the hotel is just a few steps away from an idyllic Caribbean beach. Days here are luxuriously chilled-out, while evenings come alive with the fabulous music and nightlife of the area. Relax with a glass of fruity rum punch, and enjoy the charming atmosphere and warmth of island hospitality. There’s a swimming pool, restaurant and bar at the hotel, so all the essentials are covered for your stay. Accommodation is basic, but comfortable, and far enough from the nearby nightlife to have a peaceful nights’ sleep. Time Out Hotel is geared up for couples or groups, so it’s ideal for special family holidays, wedding parties or water sports-lovers travelling together. With its ideal location, and super-friendly vibe, this contemporary hotel offers excellent value for money on your next Barbados holiday. 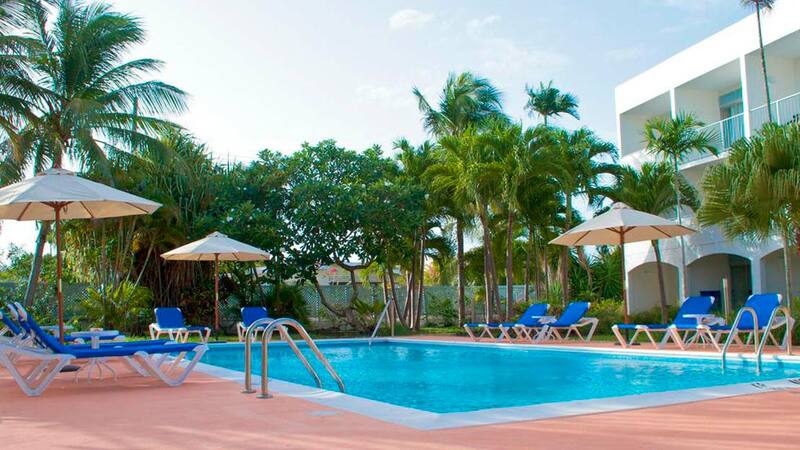 Time Out Hotel is approximately 200m away from Dover Beach, where water sports and several stalls and snack bars are available. The centre of lively St. Lawrence Gap is about 250m from the hotel. ‘The Gap’ is well known for its excellent nightlife and dancing, so you’ll find a good mix of shops, bars, music, restaurants, and nightclubs nearby. For days out, the hotel can organise an array of fun tours around the island, and Barbados Golf Club is 3km up the road. Grantley Adams International Airport in Barbados is approximately 11km from Time Out Hotel.